UCAN is a ZERO sugar, starch powder carbohydrate energy drink mix. with its proprietary ingrediant called SUPERSTARCH, it is challenging the sugar based carbohydrate sports drink market. 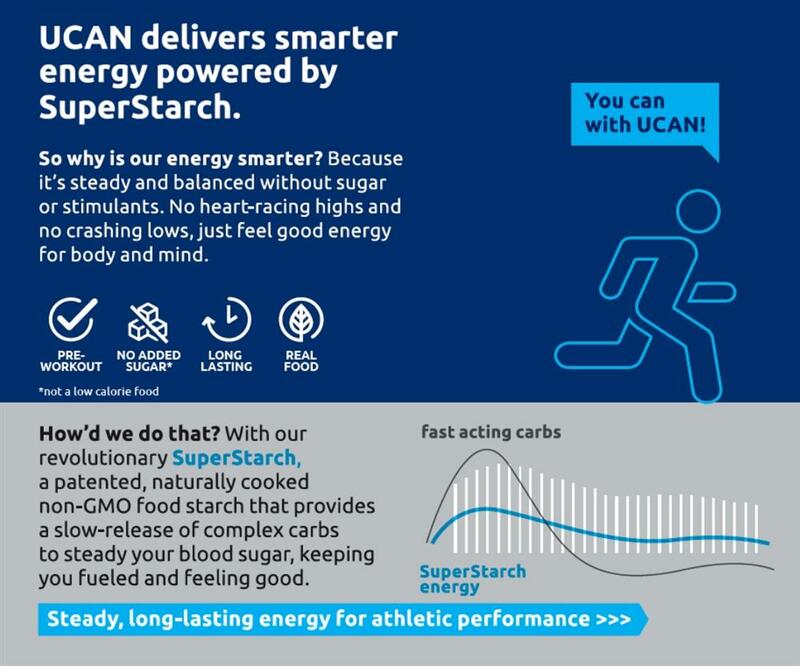 UCAN is fast becoming the fuel of choice for many of the world's top elite athletes. How is UCAN different than conventional sports drinks? Ever used a sports drink but found yourself having to re-dose cause you ran out of energy before your event was done? That's because traditional sports drinks all make use of simple-sugars such as glucose, sucrose or fructose for carbohydrate energy delivery. Many also use an ingrediatn called Maltodextrin, an ingrediant notorius for significantly spiking blood glucose levels. The result is an increase and subsequant decrease in energy levels due to the sugar wearing off. The impact this re-dosed sugar has on your blood glucose profile, subsequent health, potential diabetes and athletic performance can be detrimental. The UCAN is different to all sugar based drinks in the market in that it deliver a carbohydrate which is not in the form of a simple sugar. As a reudlt there is almost zero difference in you blood glucose levels adn in this game that translates to a very long lasting stable supply of energy. What are the result when you use UCAN? Simply, a much healthier carbohydrate putting you in the ideal performance state. Copyright © 2019 UCAN SA. All rights reserved.